Robot Wars Is Back! What Can We Look Forward To? Robot wars is back after more than 12 years away from our screens. The much awaited new season is set to activate on BBC2 this year as the robot wars enthusiasts gather for a series of high tech episodes. The concept was first broadcast in 1998 on BBC before relocating to Channel 5 for its last series 12 years ago. Robot Wars will return home to BBC two this year within the brand new purpose built arena. What’s new for Robot Wars 2016? Lights, Camera, Action – brand new high tech cameras will be used to film every bit of the action allowing viewers to get closer to the action than ever before. Power – Technology has advanced over the past 12 years to create a much smaller battery. Combine this with the extremely light materials and we will witness the most powerful robots yet. The Brains Behind The Robots – This years series will have a refreshing element as we discover a little more about the roboteers themselves. New Presenters – In its heyday we saw Jeremy Clarkson followed by Craig Charles but this year we will see an Irish duo O’Briain and Angela Scanlon. A new selection of judges will also take to our screens equipped with masses of robotics experience. House Robots – Sir Killalot, Matilda, Shunt and Dead Metal are returning to the stage and will be deadlier than ever! Make sure you don’t miss an episode, watch the latest BBC series here. 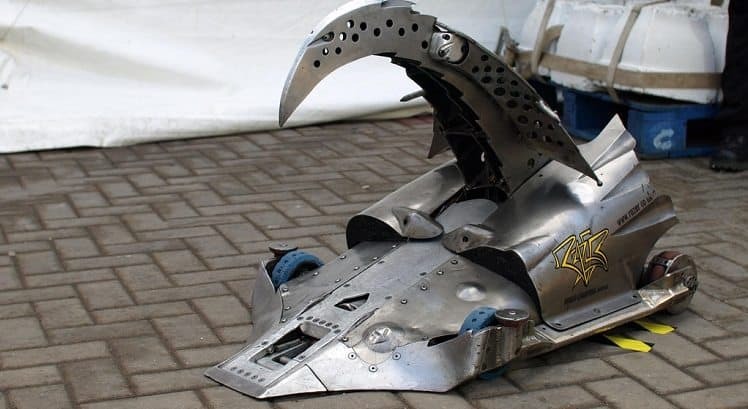 Team Tactics offers the chance to try out your very own Robot Wars team building event, contact us for details.